Online videos seem to be a trend with various online communities. It’s one of the most consumed content online, especially on social media. If you’re a creative person and has a lot of videos to showcase, you’ll want to use a theme that will allow you to feature your videos optimally. Thanks to WordPress, you can use a theme that’s fit for this and be able to complement it with powerful plugins for maximum website quality. To get your hands going, we’ve featured five themes below that will make it easy for you to showcase your self-hosted videos. Suitable for bloggers and YouTube vloggers, Videoly’s layout provides 16+ thematic templates to help you decide what’s perfect for you. It has six different sliders and layers, unlimited sidebars, and more than ten custom widgets to choose from. As for the video, it supports various formats such as for YouTube, Dailymotion, Vimeo, and more. It also offers more than 500 Google fonts and Visual Composer to help you build your layouts. VideoPro is a solution for video junkies who want to share their content with the world. It’s built upon the True Mag theme which is one of the most downloaded themes on WordPress. It’s a premium quality theme with various video networks supported including Facebook, Twitter, Vimeo, and Twitch. VideoPro offers three blog layouts and an affiliate feature to promote content using external links. You can set up channels, playlists, and even build a movie series. 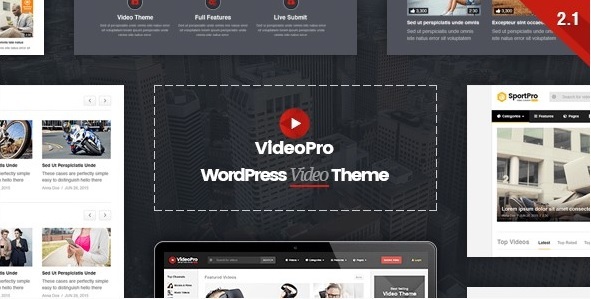 VideoPro also supports live videos and video related plugins like WP Video Robot. 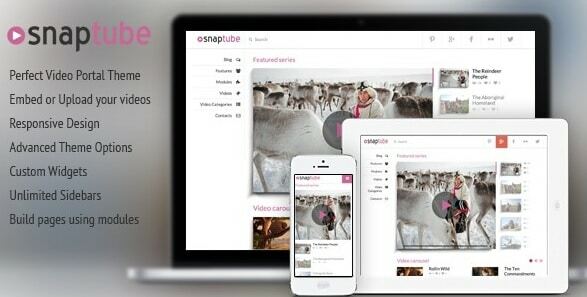 Snaptube is a powerful WordPress theme that’s packed with features. It prides itself with its three-step setup that within just a few seconds, you already have a functioning website for your videos. The bonus is it also comes with famous plugins like Contact Form 7, BuddyPress, and WordPress Video Gallery. Snaptube is retina ready and supports embedded and self-hosted videos. It allows for a drag-and-drop customization which is a time saver but can still be able to a professional layout. A modern theme that’s packed with video essentials, VideoMag is a powerful video portal for amateur and professional video maker. The clean and unique layout provides a better user experience for its visitors. It also has lots of customization options, unlimited sidebars, and supports multiple video formats. One thing that sets it apart is it auto generates thumbnails for videos such as YouTube and Vimeo to speed up your site by saving it to your server. With minimalistic and clean layout, VideoTube is a fully responsive and functional theme perfectly made for video uploads and audio streaming. It allows other users to embed their videos and it supports huge sites like YouTube, Hulu, and DailyMotion. To add to that, VideoTube is already AdSense ready. 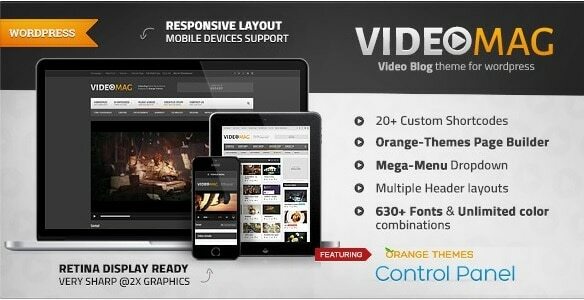 VideoTube has more than 3,000 sales on ThemeForest and an impressive 4.69-star rating. It’s one of the best themes perfect for entertainment industry endeavors. These collection of themes are functional and interactive and are perfectly built for video sharers alike. Each of them comes with powerful features that are worth exploring. Right now, videographers, vloggers, and even freelancers are equipped with different types of videos to share that’s why themes that are built for them have been popping out here and there. When it comes to choosing the best, it will always be down to each one’s preference. We hope these themes we hand-picked are a perfect match for you! If you’re looking for more WordPress themes perfect for video hosting, check out this post at Colorlib!